Wow… This week’s episode of Game of Thrones certainly made the waves and shocked the pants off of numerous fans. One episode shy of the season finale, and the episode writers decided to reveal one of the bloodiest scenes from the series. All I can say is wow! My condolences to the fans who didn’t see this one coming. I wish I could have warned you, but you know how spoilers are! And I thought it best if you saw it for yourself. 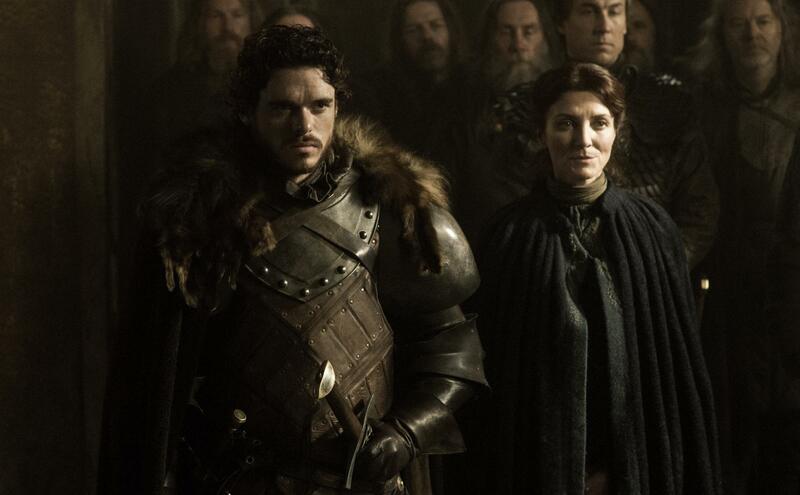 The episode opens with Robb and his bannerman arrived at the Twins to meet with Lord Walder Frey. After trotting out his daughters to recieve Robb’s apology, he inspects Talisa Maegyr and makes some extremely vulgar comments. Meanwhile, Edmure Tully is sure to keep a close eye on the Frey girls, as he knows that he is betrothed to one of them. However, their initial meet and greet ends before he can, and the date for the wedding set! On the night of, as Robb’s camp is liquored and fed outside, Frey introduces his daughter to Edmure, who is pleasantly surprised. They say their vows, are joined in the sight of the Seven, and the festivities commence. Dinner is served, the wine flows in abundance, and the band plays merrily while everyone dances and carries on. A toast is made by Walder, and the bedding ceremony is called for! 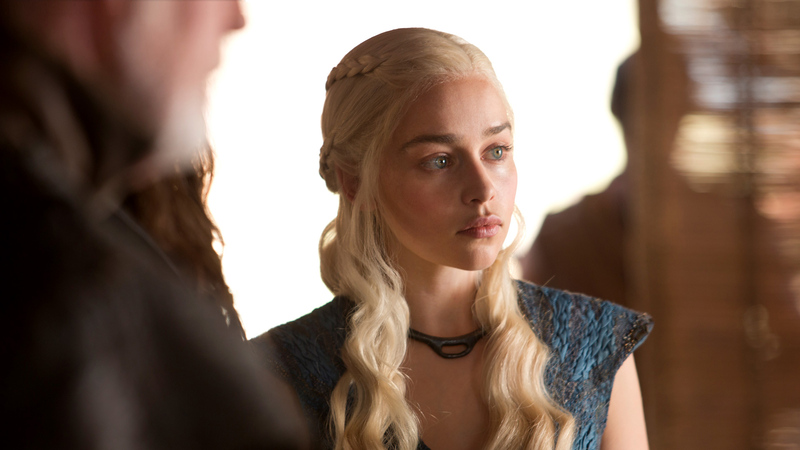 Over in Yunkai, Daenerys’ and her captains, which now includes Daario Naharis, prepare to invade the city. He suggests using a rear gate that is frequented by his men when seeking ladies of the night. Volunteering to lead Grey Worm and Ser Mormont inside, he plots to open the gates from within and let the Unsullied inside to sack the city before its defenders realize they are under attack. Moving at night, Daario is true to his word and enters the back gate, kills the guards, and leads Grey Worm and Selmy inside. They are attacked by several more guards once inside, and hope seems lost… Many hours later, Selmy, Grey Worm and Daario return to Daenerys, claiming victory and presenting her with the Harpy flag of the city. Yunkai is now hers to rule and the slaves are set free! Not far away, John and the Wildling party led by Tormund come upon a horse-breeders farm. Finding one man there alone, they plot to kill the man and take the horses, but John insists they leave the old man alive. He is ignored, but managed to alert the man’s horses before they get the drop on him, and the old man escapes. His other horses are taken and several of the Wildlings go after him. Just south of the Wall, Bran and his companions find their way to “The Gift”. land that was entrusted to the Night’s Watch by Brandon the Builder. Finding an abandoned windmill, they decide to take shelter for the night and wait out a storm. They notice the horse breeder riding by, and have the perfect spot to watch as he is overtaken by the Wildlings. Hodor’s yelling begins to give them away to the Wildling party. He is stopped only when Bran uses his “skinchanging” technique to invade his skin and take command of him. When John and the rest catch up with them, John is told to kill the old man as a test of loyalty. John is unable, and Ygritte steps in and kills him with an arrow. 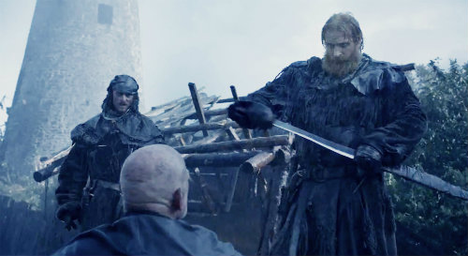 Tormund orders John dead and begins fighting with them, and is saved by the intervention of Bran and Rickon’s direwolves, whom Bran managed to take control of with his skills again. However, Orell manages to get his hawk to deal some gashes on John, and he rides away injured, leaving Ygritte behind. In the windmill, Bran says his goodbyes to Osha and Rickon. After saying yet again that she won’t go beyond the Wall, Bran tells her that she need not come. And Rickon he insists needs to stay behind, due to the dangers they are likely to face. He leaves them then, ordering them to head to House Umber’s holdings. Since they are the bannermen of the Starks, he knows they will keep him safe. In the Riverlands, Arya and Ser Sandor “The Hound” learn of the wedding as they get closer to the Twins. They arrive just in time to find that the outside of the castle grounds is littered with tents and men, Robb’s entire host which has been billeted there for the evening and is raucously partying. Inside, Edmure and his new wife are taken from the hall to be bedded, and things quickly turn bad! The band, which until now was providing joyous music, begins playing “The Rains of Castamere” and the doors are shut. They then produce crossbows and lets loose on Robb and his bannermen.Talisa is stabbed to death in her stomach, killing their unborn child, and Robb is hit by several bolts. Like I said… wow. Having read the books, I was somewhat prepared for the event, but that didn’t make it any easier to watch. Not only did they convey the “Red Wedding” in all its horror, they even upped the ante by adding an extra horrorific. In the novels, you see, Talisa was not at the wedding, and was therefore not amongst the victims. Which meant that no one stuck a blade in her belly and murdered her unborn child. 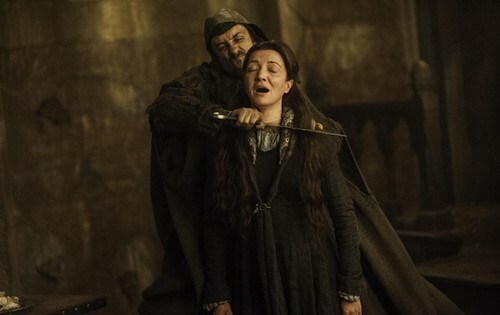 That was truly horrible and bloody, and makes me want to see Walder’s head smashed with a rock! Aside from the bloody resolution to the Stark’s campaign to avenge Lord Eddard Stark and establish a “King in the North” (which I still think sucked! 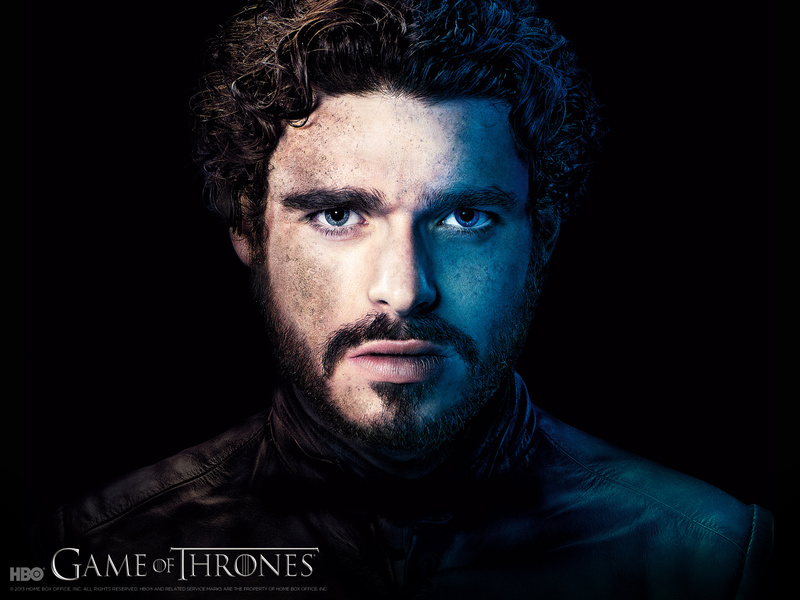 ), there was Robb’s journey north and John’s all-important escape from the Wildlings. After being lost to his brothers for so long, he is now free to return to them, and knows the Wildlings plan of attack. And said attack is coming soon! In addition, Daenery’s private little empire now accounts for Yunkai and her power is growing. Now, only the port city of Mereen remains, with its vast array of ships and slaves to be freed. And of course, there’s plenty of intrigue still to be had in King’s Landing, where – as is the them for the end of this season – another wedding is about to commence. And believe me when I tell you, it too is going to have its share of surprises! And this week, I’ve decided not to be so nitpicky. If there’s one thing I’ve noticed, its that the show has a way of taking changes and steering them back into the fold. For example, Roose’s Bolton earlier betrayal of letting Jaime go now makes sense in the context of his betrayal at the wedding, which was true to the novel. In addition, having Talisa around for much of the show now, and having her at the wedding, made for a much more emotionally-involved spectacle when she died. And sure, the part involving Daenerys’ forces infiltrating Yunkai, that too happened differently in the book. You see, in the novel, Selmy had been in disguise prior to this point and his the true identity had just been revealed. At the same time, she learned that Mormont was originally involved in the plot to poison her after she married Drogo. Incensed, she sent both men into the city using the sewers and managed to take it from the inside. Here, they changed that, but I would imagine they’ll steer things back soon enough. 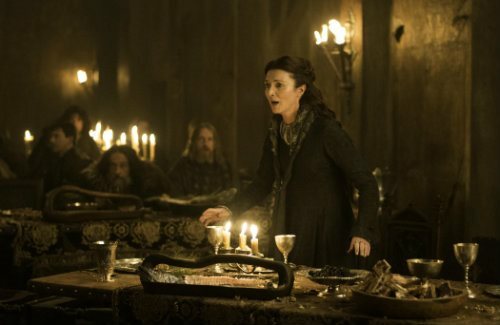 And Catelyn did not take Walder’s wife hostage in the book, but rather his “simple” son, who due to Walder’s cruel and inhumane nature proved to be a lousy hostage. But that mattered little in the face that performance. Her anguish was palatable as her son died and she sliced the poor girl’s throat out of anger and grief, only to then die herself and look almost indifferent about it. But who could expect anything to compare to that bloody, awful wedding? Though heartrending and horrible to behold, I respect the hell out of the actors and writers for how they conveyed it. The subtle addition of “The Rains of Castamere”, where no one said that it was playing, they merely trusted the audience to make the connection, was quite brilliant. And we already know from last episode the significance of this song that tells of a great House falling due to its ambition. Like I said, there’s plenty more to behold, and its all coming in the season finale. Trust me, traumatized fans. You’ll want to keep watching!